CARFAX 1-Owner. Touring trim, White Orchid Pearl exterior and Ivory interior. EPA 47 MPG Hwy/49 MPG City! Moonroof, Nav System, Heated Leather Seats, Satellite Radio, iPod/MP3 Input, CD Player, Heated Rear Seat, Aluminum Wheels, Hybrid, Back-Up Camera. CLICK NOW! Leather Seats, Navigation, Sunroof, Heated Driver Seat, Heated Rear Seat, Back-Up Camera, Hybrid, Satellite Radio, iPod/MP3 Input, CD Player, Onboard Communications System, Aluminum Wheels, Keyless Start, Dual Zone A/C, Smart Device Integration Rear Spoiler, MP3 Player, Keyless Entry, Remote Trunk Release, Steering Wheel Controls. 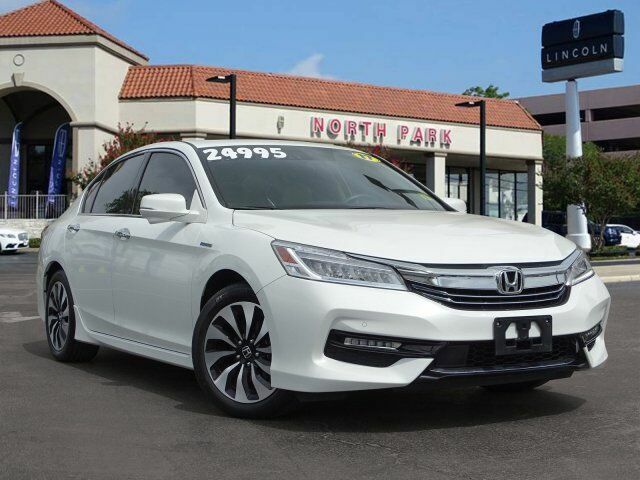 Honda Touring with White Orchid Pearl exterior and Ivory interior features a 4 Cylinder Engine with 212 HP at 6200 RPM*. The Accord delivers an excellent ride and nicely balanced handling. Road manners rank as stellar. Unlike some electric power steering systems, Honda`s inspires confidence, offering good centering and largely linear weighting. -newCarTestDrive.com. Great Gas Mileage: 49 MPG City. Radio: 360-Watt AM/FM/HD Premium Audio System -inc: 7 speakers, subwoofer, SiriusXM satellite radio, 7" Display Audio w/high-resolution WVGA (800x480) electrostatic touch-screen w/i-MID and customizable feature settings, MP3/Windows Media Audio (WMA) playback capability, Honda Satellite-Linked Navigation System w/voice recognition, Honda HD digital traffic and Song By Voice (SBV), Bluetooth HandsFreeLink, Bluetooth streaming audio, Pandora compatibility, SMS text message function, radio data system (RDS), speed-sensitive volume control (SVC), USB audio interface w/1.5-amp charging port in front and 1.0-amp charging port in center console, HondaLink, Apple Carplay, Android Auto, illuminated steering wheel-mounted audio and navigation controls and fin-type roof-mounted antenna Honda HD Digital Traffic service only available in the United States, except Alaska. Please see your Honda dealer for details.